When working with several animators, directors or even other studios, the necessity for retakes will often arise. Harmony gives you the possibility to mark new drawings as either Retake Key, Retake Breakdown, or Retake In-betweens. In the Xsheet view, you can identify drawings as Key, Breakdown or In-between. A key drawing is a visually significant pose in a movement, often an extreme position. For example, if a character that is sitting down falls on his back, the key poses would be the character sitting and the character on his back. Of course, it may vary from one animation to another. A breakdown drawing is a pose somewhere between two key poses that better shows the movement. 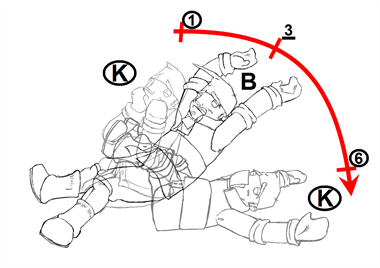 Most animation moves are arcs, such as an arm waving, somebody bending, or a leg walking. All of these movements are rotations. The breakdown pose is used to describe this curve better. 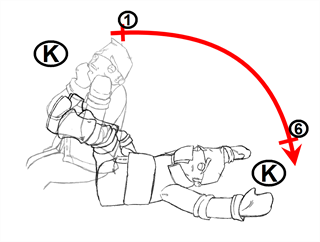 The breakdown drawing is then used to indicate secondary poses, also called the follow-through. These actions can be a big stomach jiggle as somebody jumps, a cloak floating behind somebody that is running, or arms moving after the main body action. These moves will generally have a different timing than the primary action. They will mainly start later and finish later. So, the breakdown drawings are used to complete the key drawings. Note that a breakdown drawing is not always placed exactly in the middle of two keys. It will often be closer to one or the other depending on the timing and the action. Also, you can have more than one breakdown pose between two keys.